So first i have the Beak Blast attack selected. If i select another attack (or item) but highlight the text of the attack (which happens often when trying to select an attack) it shows it as selected. But if i then attack it attacks with the Beak Blast even though it shows Hyper Voice as selected. This is a big problem when trying to weaken a pokemon to catch it but even if you have a pokeball selected it still attacks and kills the pokemon. 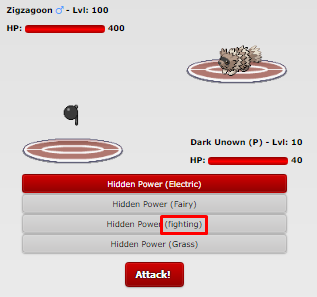 All Unown (P)'s Hidden Power (Fighting) is not capitalized as shown bellow. It would be nice to have some visual distinction between normal, legendary and maybe ultra beasts because right now on the map in your own pokedex or the pokedex in the pokedex menu on the left you can not distinguish any of them. It could be something minor to inform the player that the pokemon is a legendary or ultra beast.